Just in case you were thinking that the South Slope is the only place in Brooklyn with a crack problem, we can verify that Greenpoint has one too. 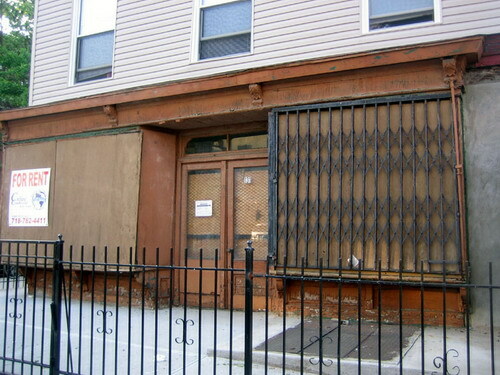 What you are looking at is a photo of 131 Meserole Avenue, which was submitted by our intrepid and very focused Greenpoint correspondent. The problem would appear to have been caused by construction next door at 133-135 Meserole, unless 131 was doing crack for a long time before digging started. (The developer of Armory Plaza in the South Slope contends, for instance, that the notorious crack building at Eighth Avenue and 15th Street was cracked out before the project began and that the gaping hole next door has absolutely nothing to do with neighboring buildings being undermined.) 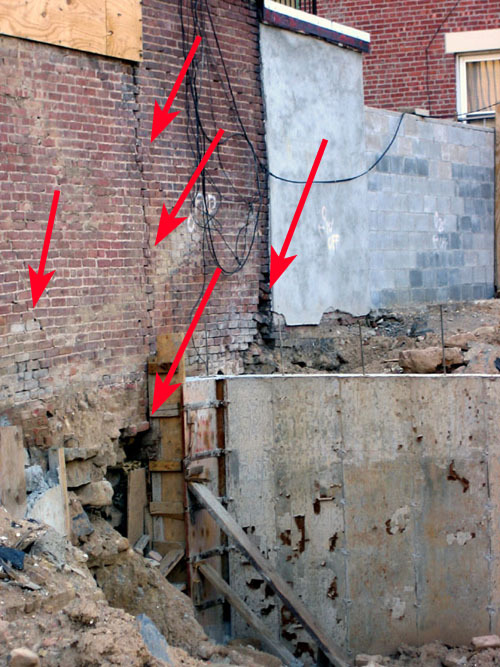 Regardless, 133-135 is under Ye Olde Stope Work Order because it is "undermining adjacent property" and because of "holes found" in the foundation of cracked out 131. The photo below, by the way, is the front of the building that's on crack. Walking past the demolition of these buildings everyday on my way to work last fall and winter, I witnessed many alarming and unsafe methods. The "construction" workers seemed to have very little experience using the excavator as it was swinging dangerously fast and close to surrounding structures. I called 311 several times to request inspection of the site. The main concern being the daycare center next door and the complete disregard of pedestrians in the area. Nice to see someone took notice.